Set up is simple. Just print on cardstock, hole punch, fill out completely, attach a ribbon/string or ornament hanger, and hang on your Pet Angel Tree (also known as a Giving Tree). For “Type of Animal” fill out whether it is a dog, cat, horse, ferret, bird, etc. You can also include the breed (Boxer, Siamese) as well as the name of the animal if it is available. You can choose to add pictures to the gift tags before hanging them. Next, list the gifts that you are seeking for your Pet Angel Tree. For example, blankets, beds, dry/wet food, chew toys, scratching posts, medicine, or a cash donation. Don’t forget to include the date that you would like to have the gifts back by. Usually 2 weeks before Christmas is enough time to shop for those who did not receive a gift. 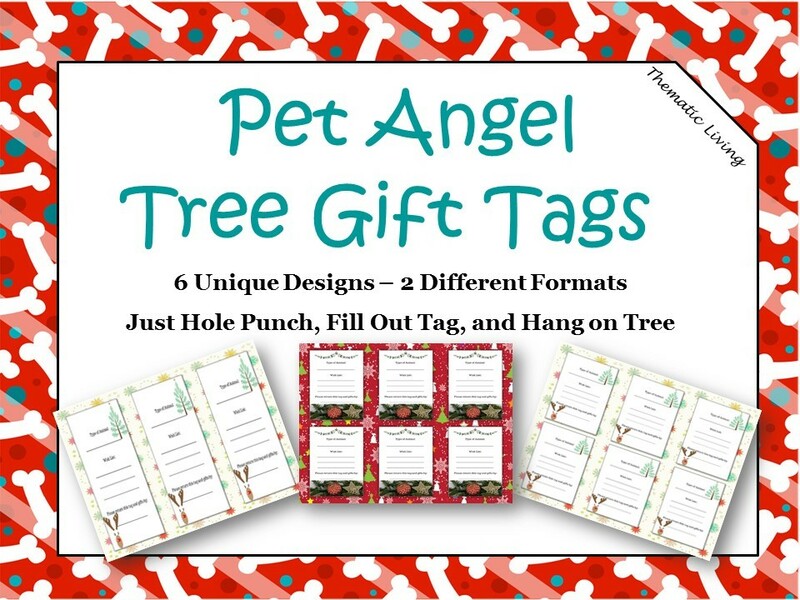 You can choose to use the longer tags or the shorter tags (depending on how many Pet Angel Tree Tags need to be added to your tree). If you want to vary the tags use the sheet with multiple designs and just complete one tag for each participant.